← Why Would I Need Teeth Whitening? Dental bridges work by permanently replacing one or more missing teeth. Tooth bridges work best in preserving your teeth and restoring the quality of your smile. When you’re missing one or more teeth, dental bridges may be recommended for you. They are used to fill the space where the teeth are missing. The dentist cements the bridges to the natural teeth surrounding the empty space. 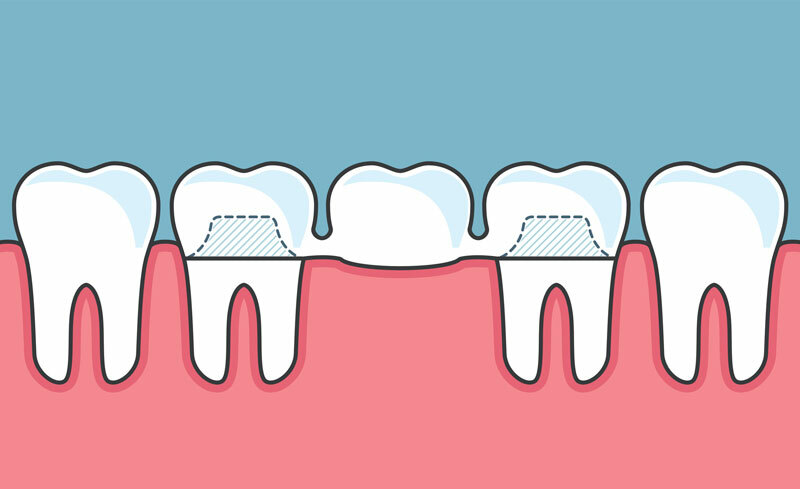 The teeth either side of the space are called abutments and are used as anchors for the replacement tooth. Dental bridges are made of porcelain material, metal or a combination of the two. Your Chula Vista dentist, Dr, Deanna Risos, will help you decide which bridges option to use by taking into consideration you’re the location of the missing tooth (teeth), cost and your aesthetic preferences. Dental bridges are essential in preserving your teeth. A missing tooth can cause serious problems such as bad bite and gum disease. This is because when you lose a tooth, the adjacent teeth due to imbalance may rotate or shift into the empty space, placing more stress on your teeth and jaw joints. Furthermore, drifted or tipped teeth are difficult to clean. As a result, they are put at a high risk of decay and gum disease. This is why it is important to replace missing teeth permanently using dental bridges. If you have losing confidence in your smile because of missing tooth, do not despair. Dental bridges are designed to give you the smile you desire for as long as possible. Tooth bridges help you achieve your dream smile because they are customized to your liking. Dr. Deanna Risos is a top-rated cosmetic dentist in Chula Vista offering the best quality dental bridges for individuals and families in Chula Vista. Schedule a free consultation with Dr. Risos to get your tooth bridge today. This entry was posted in Chula Vista Dentist and tagged dental bridges chula vista, how dental bridges work, tooth bridges. Bookmark the permalink.